Switch from imperial/metric from inside Word 2002/XP to Word 2010. 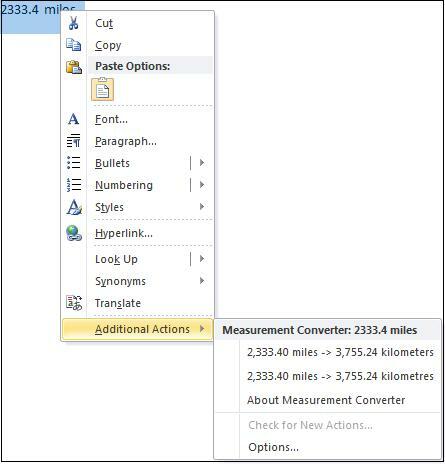 The Measurement Converter is a Smart Tag (Action in Word 2010) that can change your text from imperial/US to metric or vice-versa. As the name suggests converts measurement units used in the Word document for example convert miles to kilometers or kg to pounds. Apart from converting standard units that is already defined you can add new units to the converter and edit the conversion rules of existing units. 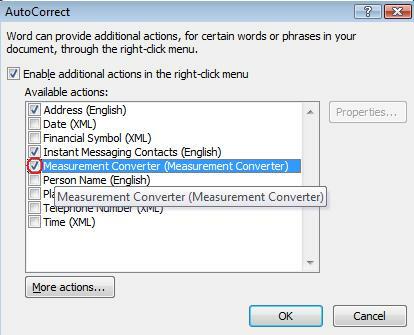 Measurement converter can also be used in Outlook when you use your email editor as Word. Measurement Converter is supplied with Office 2007 and Office 2010 so it should already be in your Smart Tags (Actions) list. For Office 2003 and Office XP go to Microsoft. There are few ways to activate the measurement converter smart tag. You can do it directly by selecting the text in the document or activate it in the Options menu. For the first method select the text in the document whose unit you want to convert. Text can be in any format for the tag to work. There is a specific syntax for it. For example for the text 60kg you will not be able to use the measurement converter smart tag. The correct text should be 60 kg. So you must provide a space before the unit name. Measurement converter supports and recognizes decimal places in the number but the length of the number should not exceed 12 digits. 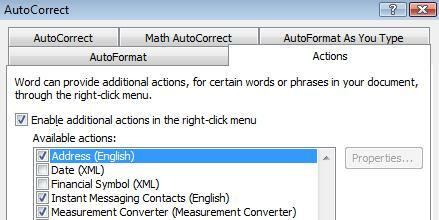 Once you select the number to convert in the document right click and select Additional Actions | Options. AutoCorrect window will pop open which displays all the available smart tags. Here select the option “Measurement Converter” and click on OK button. Now select the number again and right click and select Additional Actions. Here you can see the converted result for the selected number i.e. 2333.4 miles is converted to 3755.24 km. If there is another related unit then even the conversion result for that will also be shown. For example as shown in the below screenshot for 88 kg the result is converted to two different units i.e. pounds and lbs. For another way of activating the measurement converter smart tag, click on File | Options. In the Word Options window that pops open select the option Proofing and click on the button “AutoCorrect Options”. AutoCorrect window pops open. Here under the Actions tab select the “Measurement Converter” action and click on OK button. You can now make use of this smart tag as explained above. There is also another way to activate the tag. Click on File | Options. In the Word Options window that pops open select Add-Ins. Select Measurement Converter action from the Inactive add-ins and click on OK button. The tag will be added to the Active application add-ins. In Word 2007 go Office button | Options | Add-ins | Manage Smart Tags. 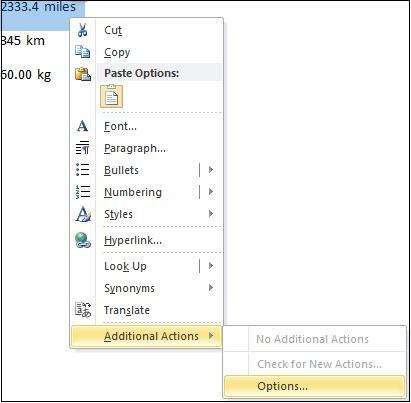 In Word 2002 (XP) and Word 2003 the Smart Tags are configured from Tools | AutoCorrect Options | Smart Tags. Result from the measurement converter is usually rounded off to two decimal places. Measurement converter is designed to work in this manner. Although the precision is set to two decimal place for most conversions it might vary for some however depending on the length of the number. Another interesting feature of measurement converter is its ability of interpreting comma and dot based on region. If you look at the conversion result you will notice the use of comma to group the values and dot as the decimal point. Now if the comma and dot are placed correctly in the number then the measurement converter will convert it accordingly but if by mistake you use comma instead of dot i.e. for example if you write 88,1 instead of 88.1 then measurement converter will check the user’s location and language options and converts based on the format defined in that region. If you observe the below screenshot the conversion result varies based on the placement of comma and dot. Like many Smart Tags / Actions, the Measurement Converter was developed by Microsoft years ago and seems to have been ignored since. That’s a shame because the converter could be much more useful with some simple code updates. We suspect that most people don’t want to replace one measurement with another, instead they want to supplement the measurement with an equivalent. For example change ‘5 miles’ to ‘5 miles (8km)’ or ‘8 km (5 miles)’. It is possible to edit, delete and add new measurement units to existing unit list. Measurement converter refers the Unicode text file metconv.txt for conversion purpose. You can open this file from the location C:Program FilesCommon Filesmicrosoft sharedSmart Tag and edit the contents. Most people won’t need to edit metconv.txt, after all the conversion ratios won’t change. You might want to tweak the names used to detect measurements, though the list is already quite comprehensive. One addition we noticed was kilometers per hour, kmh or km/h. Strictly this should be km/h as the configuration file has. However it is more commonly written as ‘kmh’ and thus a phrase like ’12 kmh’ is not recognized by the add-in. You might want to add measurements. An astronomer might want to convert light-years into parsecs. An historian might want to convert cubit, stadion, ell or giru into more familiar measures. If you do edit metconv.txt make you keep a copy of the original file just in case things go wrong. Refer the below table, from the help file supplied by Microsoft, for the field descriptions and the corresponding values to be given. The LCID is an identification number used by Windows to uniquely identify locales and languages. You can use the “&” character to define access keys in the description text. For example, “kilo&meter” will set “m” as the access key for this conversion rule. Is the source unit name case sensitive? You can use the “&” character to define access keys in the description text. For example, “mi&le” will set “l” as the access key for this conversion rule. Float value ranging from 0.00000000000001 to 1000000. The value must not include a comma.